Learning hand embroidery is both fun and relaxing, plus it's an easy way to create beautiful art with fabric and thread. 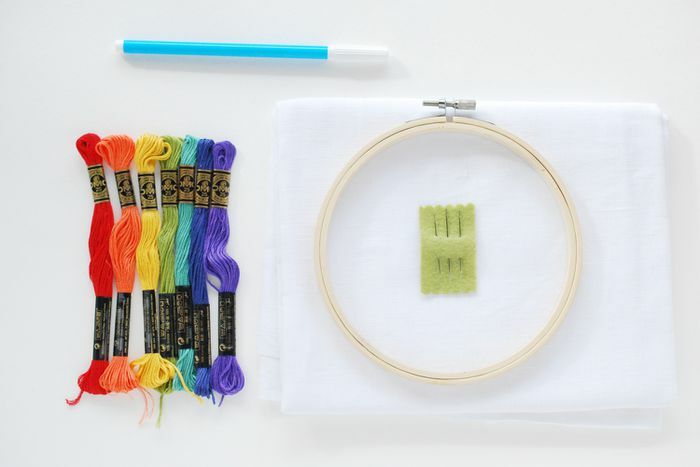 Getting started in embroidery may seem intimidating at first, but most patterns only require a few basic stitches and our stitching tutorials fit the bill. 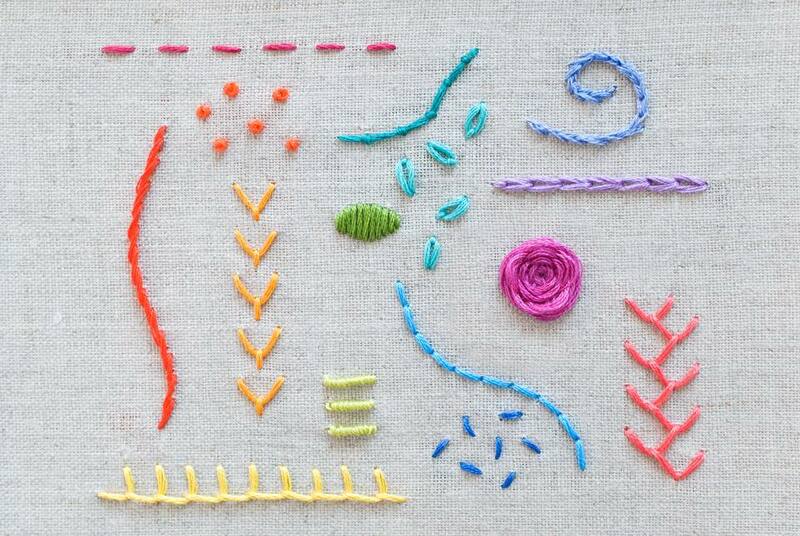 Whether you're a new stitcher or an advanced beginner, if you learn these 15 essential stitches, you'll be ready to tackle just about any embroidery project that comes your way. Backstitch is so easy to learn that you'll have it down within the first few stitches. This basic stitch is likely to be the stitch you'll use the most. Backstitch is useful for any kind of outlining, but it's also a stitch that pairs well with other stitches, making it a key stitch to learn. It's also easy to embellish with ​weaving or wrapping, and quickly transforms into the more decorative Pekinese stitch. Running stitch is a simple embroidery stitch that is good for making dashed outlines and adding details to your embroidery. It's also the basis for Japanese sashiko embroidery. Although basic, it's adaptable and can become complex. For example, you can change the look by adjusting the length and spacing or adding a second row of stitches between the first. It's also another stitch that works well with weaving and wrapping. The ​straight stitch hardly requires an explanation, because it is as simple as bringing the needle up through the fabric and then going back down. But it's worth exploring the many uses for this building block embroidery stitch. Use straight stitch to form stars, scattered fills, textures and more. Practice length and placement so you can work this versatile stitch into your work. For many stitchers, making French knots remains a challenge. While it may take time to learn, it's worth the effort. Not only is this a common stitch to find in embroidery patterns, it's also a good stitch to use when making a textured fill or other design elements. This stitch involves wrapping the needle to form a knot on the surface of the fabric. The trick to making French knots is to hold the working thread taut, but not too tight. Give it some practice. Stem stitch is another basic stitch that's perfect for creating smooth outlines. It works well for both straight lines and curves, and despite its name, it isn't only for embroidering stems. Use stem stitch on just about any lines in your stitching. Like so many stitches, you can adjust the width of stem stitching or use it for fill stitching. Just try to keep your stitch length consistent to create a beautiful result. If you want a bolder line of embroidery, then chain stitch is the stitch for you. Chain stitch forms a row of linked stitches that really stands out. There are several ways to work the chain stitch and it's a good idea to at least learn how to work it forward and in reverse. Once you have those mastered, try some of the other variations. One of the most classic embroidery stitches for filling an area is the basic satin stitch. There are a few variations, but at its essence, satin stitch is a series of straight stitches worked next to each other. What could be simpler? The secret to making those straight stitches turn into something special is in practicing the length and proximity of the stitches. The result is a filled shape that is simply stunning. Feather stitch is a linked stitch that creates open lines that almost look like they're moving. It's perfect for making frames and borders, and it works well layered or embellished with other stitches too. The look of feather stitch makes it good for stitching seaweed, foliage, feathers, or scales, and the variations make it possible to embroider a multitude of natural designs. Try split stitch as another option for making outlines. The process for working split stitch is similar to working back stitch, but upside down. In fact, the back of your work will end up looking like the front of back stitch. Use this stitch, which is made by piercing or splitting the previous stitch, for working strong and slightly textured lines of embroidery. A detached chain stitch, sometimes referred to as a single chain, is a common stitch for making flowers, leaves and more. This stitch is worked like standard chain stitch, but with just one "link." Detached chain stitch is what makes lazy daisy flowers, which are typically formed with five of six of these stitches. The fly stitch is worked similar to a detached chain stitch, but rather than making a petal or teardrop shape, fly stitch forms a V shape or sometimes a soft curve. Try fly stitch in a row, scattered as fill, stitched in a radius, or plenty of other variations. Woven wheel stitch looks like a more advanced embroidery stitch, but it's actually quite simple. Start with a star of straight stitches and then weave the working thread to form a flower. Soon you have a stitch that will fill your hoop with amazing florals. Although not always included in lists of stitches for beginners, couching stitch is an embroidery method that everyone should know. This stitch uses two lengths of thread at one time. One remains on the surface of the fabric, while the other holds it in place with tacking stitches. Use this stitch for making outlines, creating texture, or filling an area. It even works with ribbon, yarn, and other materials. Starting blanket stitch is usually the trickiest part, but once you start, it's so easy to do. Use this stitch to make borders and decorative lines or as an edge for applique within your embroidery. Add variation to the stitch by adjusting the spacing and height of the stitches. Definitely the most advanced stitch on this list, bullion knots are not for the faint of heart. But they are a stitch you should learn. Think of them as a really long french knot that can make gorgeous roses. Practice making them small and then start making them bigger. You'll be glad to know this one.